Ira Glass writes: One thing we were excited for, in reporting our two shows about Albertville, was that we could take the claims that many politicians have made about immigrants stealing jobs and driving down wages in Alabama poultry plants, and for once put their claims to the test. Find out if they were right or not. One of the leading researchers on the economic effects of immigrants, Giovanni Peri, agreed to help us out. We ran his results by several other economists, from different sides of the ideological spectrum, and they assured us the work is solid. Peri would be the first to caution, that any study looking at such a small population doesn’t have the robustness researchers always prefer. There’s more margin for error. But this is what can scientifically be said about the effect of immigrants on the area around one Alabama city. Listen: Our Town - Part One; Part Two will air December 15, 2017. This short report analyzes, using Census Bureau data for 1980, 1990, 2000, and 2010, the labor market commuting zone (CZ) 6100, which includes Alabama’s Marshall, DeKalb, Jackson, and Etowah Counties. The city of Albertville is in Marshall County. Beginning in 1990, this region experienced an unusually large inflow of less-educated, foreign-born individuals—mainly from Mexico—relative to similar labor markets in Alabama. We analyze whether the labor market outcomes for some groups of natives (specifically, those with low education and those working in the slaughtering sector) in this labor market diverged after 1990 from those of similar counties in Alabama. We adapt to our purpose an approach inspired by the synthetic control method. We use decennial Census and American Community Survey data to construct several labor market variables—such as average wages and employment of native workers with no high school degree, as well as those employed in the animal slaughter sector—in CZ 6100 for years 1980, 1990, 2000, and 2010. Additionally, we measure the foreign shares of the local population and employment, and analyze their evolution and the corresponding evolution of wages. CZ 6100 is the smallest geographic unit containing the city of Albertville that constitutes a local labor market and that can be consistently tracked over decades with Census data. We thus focus on CZ 6100 and call it the “treated market” as it received a treatment of many immigrants over the period. The map below shows the boundaries of Alabama’s commuting zones. With our data, we first construct the foreign-born share of the population and of less-educated employment in CZ 6100 in 1980, 1990, 2000, and 2010. We also construct the average wage of U.S.-born high school dropouts and their logarithm of employment, as well as their average (weekly) wage in the animal slaughtering sector. This sector includes the poultry-processing plants in Marshall and DeKalb Counties, which experienced large inflows of immigrants after 1990. We then identify within Alabama the labor markets which, prior to 1990, looked similar to CZ 6100 in terms of immigrant share, wage, and employment rates of the less educated but which did not experience large inflows of immigrants after 1990. We combine these labor markets into one synthetic control labor market. 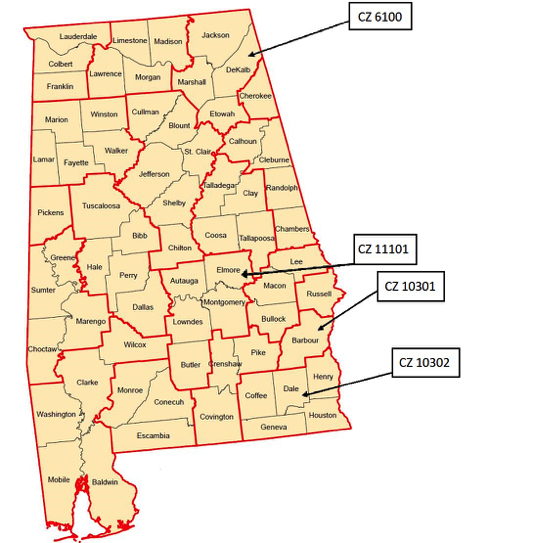 Specifically, this synthetic control is an average of three other labor markets: CZ 10301 (including Barbour County); CZ 10302 (including Coffee, Dale, Geneva, Houston, and Henry Counties); and CZ 11101 (including Autauga, Elmore, Lowndes, Montgomery, and Butler Counties). Each of the CZs which comprise the control is in the south of Alabama (refer to the map) and likely subject to similar regulation, laws, and overall economic conditions. The control had pre-1980 labor market outcomes similar to those seen in the treated labor market (CZ 6100) and the foreign-born share of its population grew much less after 1990 compared to the treated market. The figure below illustrates the share of foreign born in the population of the treated labor market (CZ 6100) and of our synthetic control, relative to the respective shares in 1990. The dashed line is the treated market, and the continuous line is the control. As the share of foreign born in the population is presented relative to the respective shares in 1990, both relative shares equal one in 1990. We note that the pre-1990 trend is essentially of no growth in both markets. Furthermore, there were very few immigrants as a share of the population in either labor market in 1990 (less than 1 percent of the population in CZ 6100). 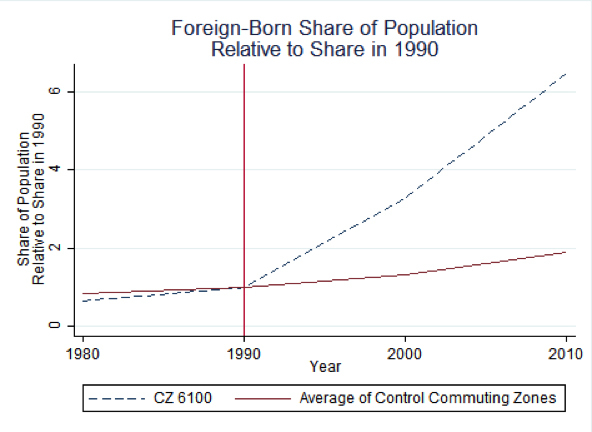 However, after 1990 the trajectories diverge dramatically, and CZ 6100 increased its immigrant share by a factor of six (more than 5 percent of its population was foreign born by 2010), while the immigrant share barely doubled in the control market. Even more dramatic is the evolution of the share of immigrants in employment among workers who did not complete a high school degree, relative to their share in 1990. The graph below compares this relative share for the treatment and control markets. We find a seventyfold increase in the share within CZ 6100, from 0.4 percent to 28 percent of the labor force, but much less growth in the control market, from 1 to 12 percent. If increased immigrant employment puts downward pressure on native wages, then the dramatic divergence between the treated labor market (CZ 6100) and its synthetic control after 1990 could provide a test for this hypothesis. If correct, the wages of less-educated natives as well as native wages in the food processing industry (where the poultry plants are) should both show a negative difference, arising after 1990, between the treated labor market and the synthetic control. Given the large differences in immigrant supply, the wage differences could be large if there is no other adjustment. The figures that follow are all expressed in constant (2000) dollars to abstract the effects of inflation from the analysis. The figure below shows the behavior of weekly wages of native dropouts , standardized to one in 1990, for the treated labor market (CZ 6100) relative to its synthetic control. Wages declined slightly for employed, native-born high school dropouts in CZ 6100 in the period before migrants began arriving, but they were constant in the control market. Post-treatment, we do not find any difference between the two markets through 2000, with some negative difference emerging in 2010 and resuming the slight downward trend, which was evident before immigrant inflows began in earnest. The difference in cumulated wage growth from 1990 to 2010 between the treatment and control markets was about $23 per week, or 7 percent of the weekly wages in 2010. However, the pre-1990 trend shows that CZ 6100 was already on a slightly slower wage growth trajectory for less-educated workers, and no clear change was seen after 1990. 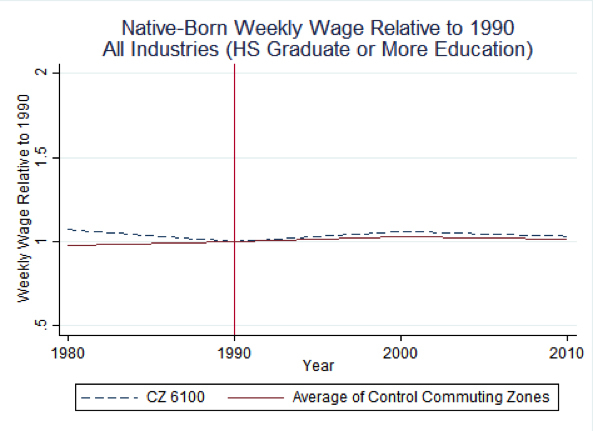 The lack of a clear divergence in the two lines after 1990, relative to their difference before, suggests that the large inflow of immigrants was not accompanied by significant wage depression for less-educated native workers in CZ 6100. The figure below looks at average wages of natives in the animal slaughtering sector, including all workers. A small negative difference appears in 2000, which then becomes positive in 2010. Overall, the average wage in the treatment market has grown by an extra $144 per year in the sector where the poultry plants operated, relative to the synthetic control. 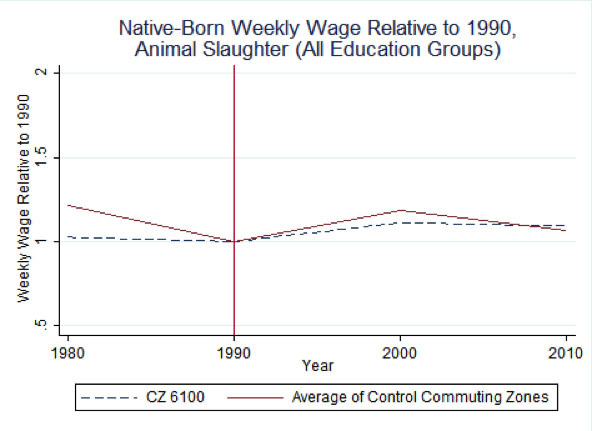 Put differently, from the time immigrant inflows began in earnest after 1990 through 2010, the weekly wages of native-born workers employed in the animal slaughter industry in CZ 6100 grew by about $12 per week relative to control, or about 3 percent of the 2010 average. Even in this case, however, there was some difference in the pre-1990 trend, and we do not observe any striking difference between CZ 6100 and its control group post-1990. The following figure looks at the employment of high school dropouts. Again, no marked differences appear post-1990 when immigrant inflows to CZ 6100 began in earnest. In this figure, we have standardized the natural logarithm of native-born employment in 1990 to zero in both labor markets, and have traced the differences in changes (log differences) for both treatment and control. The trajectories show no large difference in percentage changes after 1990. Of course, the employment of less-educated workers is on a long-run negative trajectory for both markets, as the employment rate of this group has been shrinking over decades across the United States. We next explore the labor market outcomes of more-educated native-born workers. The average years of education completed by native-born individuals increased notably over the period from 1980 to 2010. Less-educated and more-educated workers often complement each other in production, so if other things are equal we may not find any negative effects of immigration on more-educated natives. If, however, native-born workers who would otherwise have chosen to not obtain more education instead chose, in the presence of some perceived increase in labor market competition from less-educated immigrant workers, to obtain additional education, then it might be possible that this additional competition among more-educated workers would show negative effects on those workers, relative to our control group. We focus our attention on individuals who completed high school, and then specifically on those with some college or more education. The two figures below show the average weekly wage of more-educated native workers (high school graduates or more education in the first figure, and those with some college or more education in the second figure), standardized to one in 1990. As with less-educated native workers, wages for more-educated native workers in the CZ 6100 tracked wages in the control group before 1990. Post-treatment wages grew slightly faster in CZ 6100 for both groups, suggesting more-educated native workers may have been slightly helped by immigration. Looking at employment reveals a similar story. As with high school dropouts, the figure below shows differences in the natural logarithm of native-born employment in 1990, standardized to zero in both the treatment and control labor markets. Employment of more-educated natives grew in both labor markets as educational attainment increased. Growth in CZ 6100 closely tracked that in the control group, growing somewhat less quickly (relative to control) prior to 1990, but slightly more rapidly post-treatment. As with the wage analysis, the employment data suggest that more-educated natives saw a small benefit from increased immigration, and at the very least were unharmed by it. Let us emphasize, though, that the differences in CZ 6100 and control are small after 1990 and not much larger than the difference pre-1990, just as in the case of high school dropouts. The analysis essentially does not provide strong evidence of wage or employment effects for any of these groups. Our analysis shows that CZ 6100 experienced extraordinary growth in immigrant population between 1990 and 2010, increasing their population share by a factor close to 10. This was very different from the experience of other counties that we take as a control group. The employment and wages of less-educated natives and of natives in the slaughtering sector, however, did not show much difference between CZ 6100 and the control group over the same period. Hence, as documented in the economic literature, there does not seem to be very much evidence of negative wage or employment effects of immigrants on natives. Immigrants not only bring labor but also local demand, and often they work in jobs differentiated from those of natives. Moreover, their presence may attract investment and bring the creation of complementary jobs for native-born workers. The very large increase in immigrants in some counties of Alabama, especially of less-educated workers in the labor market that includes Marshall and DeKalb Counties (CZ 6100), does not seem associated with a comparable depression of native wages or employment. To summarize: After 20 years of immigrant inflows, which increased the immigrant share of less-educated workers from close to 0 percent to 28 percent in the treated market, the weekly wages of high school dropouts grew at a slightly slower pace, while wages in the animal slaughtering sector grew slightly faster. This analysis does not support the idea that less-skilled immigrants have large depressing effects on wages and employment of less-skilled natives. Consistent with the evidence presented in other studies, immigrants may fill some manual jobs in certain industries, creating complementarities and hence gains in productivity and wages in other jobs within those industries, attenuating the potentially competitive effects that would otherwise have depressed wages. Importantly, the effects on native wages are rather small because the direct competition from immigrants can be attenuated by other margins of adjustment, and because the business-creating effect in the industry offsets the competition. We use the 1990 commuting zone definitions throughout the analysis. We do not include the size of the manufacturing sector or the industrial composition of the counties as variables to match. This may allow that the control group chosen has a somewhat different industrial composition than CZ 6100. As standard in this literature, to calculate the wages of dropouts we include in the sample individuals older than 18 who were employed for at least one week and received positive wages, who were not residing in group quarters or attending school, and who did not have a high school degree. Giovanni Peri is professor of economics and chair of the department of economics at the University of California, Davis. He also directs the Migration Research Cluster. Peri has published extensively in academic journals and books about the economic determinants and effects of human migrations. He has received grants from the MacArthur Foundation, the Russell Sage Foundation, the World Bank, the National Science Foundation, and several other institutions. His research on migrations is often featured in The Economist, The New York Times, The Wall Street Journal, and other popular newspapers and blogs. Justin Wiltshire is a third-year Ph.D. student in the department of economics at the University of California, Davis. His research explores urban and regional decline and revitalization in the industrialized world, as well as the effects of labor market regulations on economically disadvantaged workers. He has worked as a labor economist with the U.K.’s Civil Service and as a flight service specialist in Canada. Prior to that, he worked numerous entry-level service jobs from which he’s drawn inspiration for his research. He holds master’s degrees in economics from Simon Fraser University and the London School of Economics.